Residents who repurposed vacant lots through Chicago’s Large Lot Program reported in a new study that the projects made their neighborhoods safer, quieter, friendlier places to live. 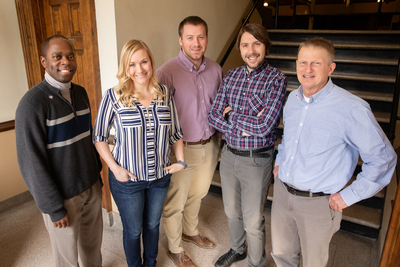 The study was co-written by U. of I. scholars, from left, postdoctoral researcher Douglas A. Williams; natural resources and environmental sciences professor Carena J. van Riper; graduate student John Strauser; and recreation, sport and tourism professors Alessandro Rigolon and William P. Stewart. CHAMPAIGN, Ill. — Chicago’s vacant lot-repurposing program is enhancing not just the curb appeal of blighted properties across the city, but also the culture and safety of the surrounding communities, residents said in a new study. The majority (54 percent) of the lots purchased adjoined buyers’ existing properties, while 24 percent were less than five lots away. Some of the participants said that owning the properties strengthened their feelings of investment and pride in their community. While empty lots often serve as painful reminders of people, jobs and resources that are no longer there, resident-led neighborhood improvement efforts such as the Large Lot program “allow people within the community to dictate what the future is going to be,” said graduate student John Strauser, who co-wrote the study. Working with neighbors to care for urban gardens enables residents to “actively envision the transformation of bleak circumstances into places of opportunity for a better life,” co-author Douglas A. Williams wrote in his doctoral dissertation, which examined the effects that repurposing vacant lots for urban gardens had on residents of one of the neighborhoods in the current study. Williams’ personal ties to some of the residents may have fostered trust in the study that encouraged more community members to participate in the survey, the researchers said. Those personal connections, coupled with the public support of the other project partners, helped the team attain a 71 percent response rate on the survey. The study was published recently in the journal Landscape and Urban Planning.